The Days of Johann, an agility dog! : This flashlight is cool! 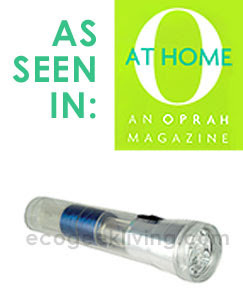 We definitely want one of these, it's cool, eco friendly, and fun...it's a shake LED flashlight. It doesn't require batteries or wires, you just shake it for one minute and it's powered up for 30 minutes. And they say it's bright (powered by 2 super bright white LEDs). They say it's waterproof too. This flashlight would be pawsome for agility trials. Sometimes we get there pretty darn early and need to find something in the car. This would be perfect. And look, it was featured in Oprah's magazine, and if you visit the site you'll see it's getting good reviews. Oh and did I mention that I saw today that it's on sale! Cool! We totally have one of those - it's pretty neat but I wouldn't say the light is actually bright (mom deals with some pretty bright flashlights) but it works. I can't attest to how long it stays active after you shake it for a minute but the light is definitely brighter during and for a few moments after you finish shaking. Johann, I have one something like that. You have to kind of 'pump' it with your hand to get it powered up. It's really useful for a night walk around the streets when you need to see to pick up after the dog. That would be awesome for agility! I want one... batteries are so evil.